This week we did Chocolate Babka, Walnut Raisin Mandel Bread, and Challah. Sales were good -- we sold out of or bartered everything we brought, minus about 3 breads. 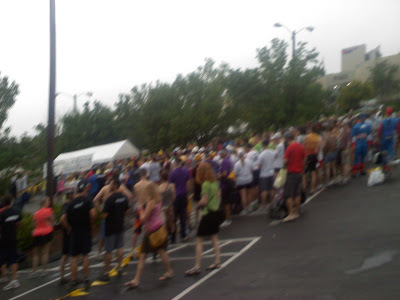 The Doughman competition began and ended in the parking lot adjoined to our location. It was fun to hear from the competitors firsthand about all the nasty food they consumed (e.g. Vegan Meatballs, Lamb Sloppy Joes). Big up to Summer, the Weavers, and ACP and Jaime + bump for visiting the stand. Thanks to: RML, SZ, LP for your assistance. In the early morning, AS and SZ helped me form all the bread -- you guys were awesome. I bartered with Noah Ranells of Fickle Creek Farm and George from Lil' Farm. George, for better or for worse, is as generous a person as I am. If I give him a challah, he gives me like 4 heads of greens, which means I have to go back to the stand and bring him back a bag of Mandel Bread, which means that he has to offer to give me some herb plants. I told him he should familiarize himself with Potlatch societies, wherein tribes are bound together by bartering/trading/gifting rituals. For all the anthropologists out there, I recommend Marcel Mauss' The Gift on this subject. Once we arrived home, Madeline ate piece after piece of the Chocolate Babka, asking for "more cake please" after each piece. I managed to snag a couple of delicious pieces too!